Fairy Fencer F is an RPG developed by Compile Heart. It was released on the PlayStation 3 in Japan on October 10, 2013, in North America on September 16, 2014, in Europe on September 19, 2014, and in Australia on September 25, 2014. A Windows version was released on Steam in North America on August 4, 2015. 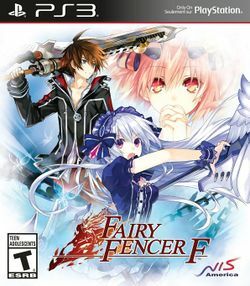 An enhanced version titled Fairy Fencer F: Advent Dark Force was released on the PlayStation 4 in Japan on November 5, 2015, in North America on July 26, 2016, in Europe on July 29, 2016, and in Australia on August 4, 2016. This version adds new paths to the story and increases the size of the active party from three to six members. This page was last edited on 18 August 2016, at 18:21.